I have been following the GFS and other models for a few days now. 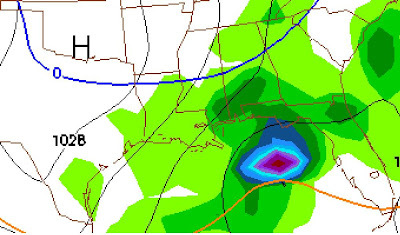 There has been an unusual amount of run-to-run consistency as well as model-to-model consistency (with a few exceptions) about the possibility of a snow event in the South on Monday February 2, 2009. Admitting that I am an amateur (yet experienced) observer, I will share my thoughts. I do not often do this, but I thought I would give it a go. I prefer to observe. It is much easier to observe and study weather than to predict it! Right are wrong, these are my original thoughts, combining information gleaned from the models and experience. Snow is rare in the South. Snow events are the most over-hyped and often busted forecasts. Predicting snow, and especially accumulation, is tough anywhere but especially in the South. This is a good time on the calendar, climatologically, for this type of event in the South. This is roughly the type of set-up (cold air in place, although it would help if it was a little colder, and a low forming in the Gulf) for snow accumulation in the Deep South. It is dangerous to predict snow too far in advance. People get to0 hyped up and too let down when it doesn't happen. There are many variables that are hard to resolve 6 hours before the event, much less three days. Snow is usually a relatively isolated event. It is typical for there to be a rather narrow band of heavy snow accumulation that often quickly tapers off to very little. People are inevitably going to blame the forecaster if their specific point doesn't get what they want. When snow events actually do materialize, forecasters tend to often underestimate the amount of accumulation within the heaviest band. I remember many times listening to forecasters having to increase the amount predicted after the event was already underway. Timing is a major issue. Models will continue to adjust the timing on this. Placement of the low is critical as to who gets what. We are talking about a system that hasn't even formed yet! Now, without further ado, here is what this morning's GFS is telling me, along with my interpretation. A low forms in the Northwest Gulf while most of the South has temperatures in the 30's and 40's. Rain begins in East Texas, Louisiana, South Arkansas, and West Mississippi. Light snow begins in areas north and west of a line from Little Rock to Memphis to Nashville. 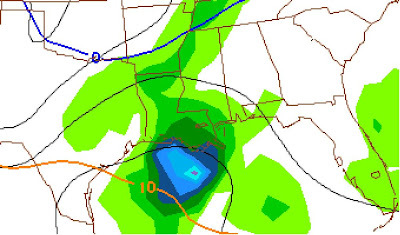 GFS Valid Mon 6 a.m.
Low pressure intensifies south of New Orleans. Rain increases in coverage and intensity from East Texas to South Alabama. Snow increases north of a line from El Dorado, AR, to Tupelo, MS, to Huntsville, AL, to Chattanooga, TN. 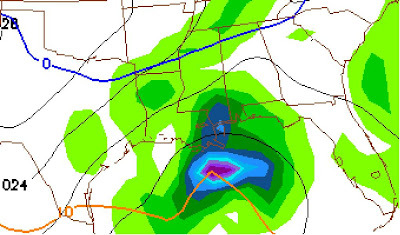 GFS Valid Monday at Noon. Low continues to intensify south of the Alabama coast. Colder air is drawn in from the north and west. Rain continues from East Texas to South Georgia. Rainfall becomes heavy in some areas. The rain snow line moves south. Snow occurs north and west of a line from Tuscaloosa to Birmingham, to Anniston, to Atlanta, to Charlotte. Rain and snow end from west to east. Rain briefly changes to snow as far south as Monroeville, Alabama and Columbus, Georgia. No one knows, but it looks like someone between Nashville and Birmingham could get significant accumulations. And you're right . . . it really is hard to predict stuff. Every since I started it . . . I've appreciate dthe good forecasters a lot more!